Well it’s Sunday morning and me and Tiffany were bouncing ideas off each other for breakfast. It’s kinda a regular thing that we make a big deal for us to cook up something yummy and do something fun apart from our work week. So after much consideration first I came up with gravy, need I say more, then naturally, yes biscuits came to my mind. Well I guess that was a good start, then thought I really needed get it up a notch so, yes chipotle why not. Yep good idea, I love the smokey subtle heat of the chipotle, so why not, I usually keep some around and they keep forever, and it’s what I had on hand, Macgyver would be proud. So off to the races it was the smack down an a classic dish loved by many. Well here is my take on a just a simple breakfast dish. So what is your favorite brunch plate?? In a medium sausage pan over medium heat brown pork sausage and drain fat. Mince chipotle and add to pan cook and stir occasionally for 5 minutes. In a separate bowl combine milk, flour, salt, and Pepper and whisk and pour into sauce pan. Simmer on medium heat until it boils for 1 minute then reduce heat to low. 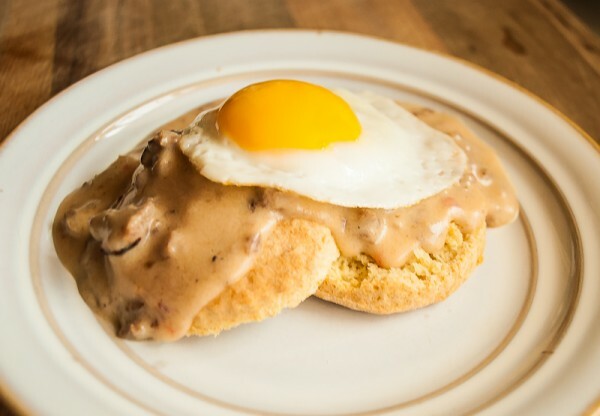 To plate, cut biscuts in half, spoon a portion of gravy over biscuits and place egg on top.